An artist’s rendering of the arches coming to Second Street. Local real estate agent Nick Rutman said he could make no promises. However, Rutman also said the Friends of Portsmouth organization of which he is the official spokesperson, hopes to have the first lighted arch in place over second Street in Boneyfiddle by Memorial Day. With no discussion previous to a unanimous vote, Portsmouth City Council passed legislation Monday authorizing City Manager Sam Sutherland to enter into an agreement regarding the arches with the Friends of Portsmouth. During a February council session, Friends member and Portsmouth First Ward City Councilman Sean Dunne mentioned there would be up to 10 arches on Second running through Boneyfiddle from Washington Street. Rutman later said engineers and planners need to determine exactly the safest locations for the arches, which will help determine the actual number of arches installed. He said the basements of some buildings along Second Street extend out far enough into the roadway to eliminate some spots as locations for building an archway. “We obviously don’t want to end up in somebody’s basement,” Rutman said. Rutman added more recently that the process of trying to find practical locations for arches continues. He reiterated that process will help determine the number of arches which ultimately appear. Local developer, entrepreneur and one of the founders of the Friends organization, Tim Wolfe first discussed the arches publicly roughly one year ago in April 2018. Wolfe first talked about modeling the Portsmouth arches on similar structures decorating the now well-favored Columbus commercial district Short North, formerly largely regarded as a struggling, somewhat shabby, crime-ridden neighborhood. Initially Wolfe talked about the Portsmouth arches including the historic Boneyfiddle name integrated into their design. 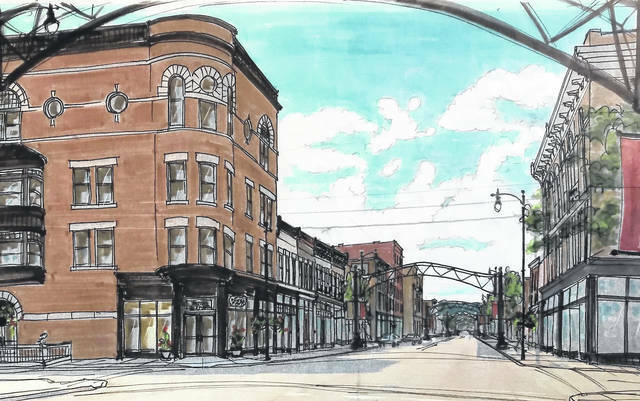 Based on what is presumably an updated artist rendering of what the arches might look like provided by Rutman in February, the idea of integrating the Boneyfiddle name into the arches has been dropped. Talk of the arches always has included talk of lighting those arches, including decorative lighting during the Christmas holidays. During the February Portsmouth City Council discussion of the arches, Dunne talked about the arches possibly supporting Second Street streetlights. Rutman previously has said the arches will be constructed by a Portsmouth owned company. He did not want to discuss any possible price tag for the arches, though a figure of about $75,000 each was mentioned in the past. The Friends of Portsmouth said proceeds from their well-publicized and seemingly very well received Winterfest celebration held in December would help finance the arches. To date, the holiday themed Winterfest has been the Friends of Portsmouth signature event, running through the Christmas season bringing lots of decorations to include a huge Christmas tree, a temporary skating rink and other festive trimmings – not to mention thousands of visitors – to Market Square and Second Street. The event also featured a successful breaking of the world’s record for the most persons simultaneously Christmas caroling. Rutman has said his group is declining to release how much money Winterfest raised through skating fees and other activities such as the retail village and souvenir store set up on Market Square. Rutman did say a very rough estimate would put the number of skaters who paid to use the temporary rink at around 8,000.
https://www.portsmouth-dailytimes.com/wp-content/uploads/sites/28/2019/04/web1_Arch-Rendering-smaller.jpgAn artist’s rendering of the arches coming to Second Street.